Q: What kind of drumsticks does Bono use while he's drumming? A: We're told B-man utilizes customized ProMark sticks made from Japanese Shira Kashi White Oak. When asked why he didn't use a more common maple or American hickory variety, Bono allegedly answered "Japanese Shira Kashi White Oak is the most dense wood available to man for musical purposes. The stiffer the wood, the clearer the sound." Q: I noticed that the jacket that Bono wears during "Love and Peace or Else" reads 'Sinner' on the back. Why would he wear such a thing? Isn't he a Jesus-freak? A: Indeed, he is. And the message he's conveying is actually very pro-JC. The 'Sinner' statement is a reference to the character of 'Monster' that he sings about in the song. When he cries "break the monster's back" he means that he will expel this demon from the world, by way of strenuous drumming. The monster of course, being the dark force that is pulling the sons of Abraham apart. Q: Can I send in photos of Larry drumming? A: No. See URL for further explanation. Q: I noticed that Bono gets some help putting his official headband on before he drums. Why does he need help? A: Headband placement is a vital part of a rock star's overall appearance. If it isn't positioned just right on one's head, the entire performance could suffer. Enter the Vertigo Tour Headband Technician - a crucial member of the crew, specially trained in wrapping fabric around swelled heads and tying expert knots. Q: Who is the person that helps Bono put the headband on? What is his/her experience? A: This Very Important Person has asked to remain anonymous due to the importance of his/her work, however we can say that former positions he/she has held with the band include: Offical Larry Arm Taper, Designated Adam Oxygen-mask Manager, and Alternate Shirt Bedazzler for Edge (when Gwenda Evans was on vacation). Q: What does the headband that Bono wears during "Love and Peace or Else" say? A: At some shows, it says "Patent Pending." At others, "This Space For Rent." Q: I've heard that Larry Mullen, Jr. suffers from tendonitis in is arms, which is worsened by his constant drumming. Has Bono developed any medical conditions due to his new love of the instrument? A: Doctor's reports suggest 'yes.' There was talk of some slipped discs, excruciating back pain and a developing case of carpal tunnel syndrome. When confronted about these ailments, Bono simply replied "I've got blisters on my fingers!" 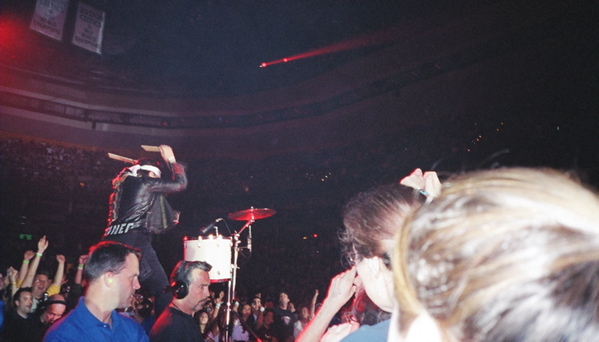 Q: Many of my friends say that when they saw Bono drum on tour, that was their favorite moment. Has he gained any notoriety for this exceptional work? A: Modern Drummer, Rhythm Magazine and Hip Rhythm Digest all had requests in to Principle Management for Bono to appear in their publications, but a few well-placed phone calls by Larry Mullen, Jr. put an end to all of that. Q: I would like to hear "Love and Peace or Else" as I enjoy your web site. Why don't you have the song available? A: Our guess is that since you're visiting a web site called bonodrumming.com, you probably own that song. Plus, there are certain things we like to avoid (read: lawsuits). Here's a suggestion though - when you click on your first bonodrumming.com photo, synchronize your stereo/iPod/MP3 player to start the song. You'll experience a Dark Side of the Moon - Wizard of Oz thing in no time. Q: I sent a photo in to your web site and you never posted it. Why not? A: Maybe Larry was in it. Or it was taken on the Lovetown tour. Or you didn't add the attachment. Or it was taken by a professional. Or Bono wasn't drumming. Look at the URL again. What's it say? Or it sucked.